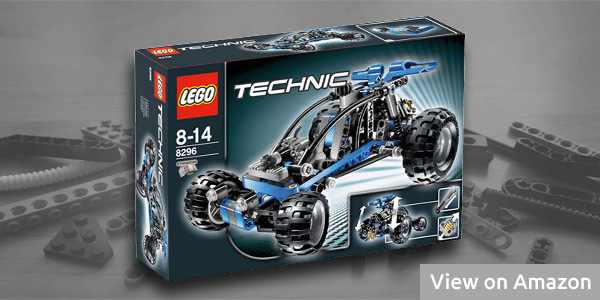 This is an older Lego Technic set from January 2008, but you can still get it as a brand new item. It is a rather small Lego set. It contains 199 pieces and the recommended age for this set is 8-14 year old. The color of the bricks is mainly blue, black and gray. What is interesting on this Lego model is that you can control the steering either using the steering wheel in front of the seat or by the black gearwheel on the top of the vehicle. It also has a small working V2 engine at its back. 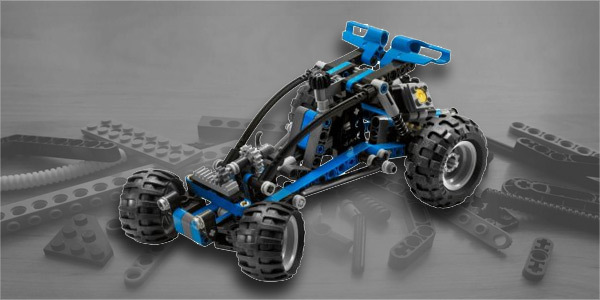 The alternative model that you can build of this dune buggy car Lego set is a tractor. There are no any minifigures included in this Lego set, as with most Lego Technic sets. Stay tuned for more Lego sets reviews that I’ll be publishing on this blog. If you want to stay updated with all my news, feel free to subscribe to my newsletter.